No question about the winners and losers here. Cowboys and Indians. Such a basic formula. Cowboys were the good guys and they won. Indians were the bad guys and they lost. Then in the '60s, Indians became the good guys. But they still lost. The concept of "defeat" is sometimes valid, sometimes an illusion, sometimes a lie, and sometimes simply propaganda by those who claim themselves as the "winners". 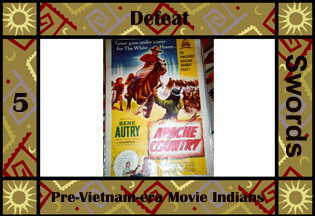 Western movie poster scalped from the Vintage Western and Cowboy Movie Posters. First Nations Site Index is an excellent resource for links and information on real Indian people and issues.